Became a valuable part of the Crows’ backline with her attack on the ball and physicality towards opposition forwards. An aggressive defender who doesn’t shy away from the contest. A dual-sport athlete who previously played for Adelaide Lightning in the WNBL. 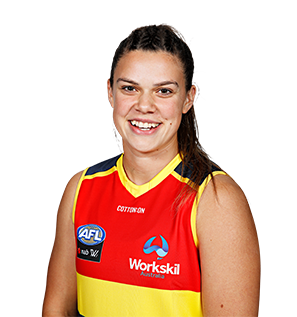 Draft history: 2016 NAB AFLW Draft 11th round selection (Adelaide) No. 87 overall. Was unmatched for her attack at the ball and opponent in in Adelaide’s backline. Missed the Club’s Round Four clash with Fremantle but quickly returned the following week to cement her place in the side for the rest of the season. A heavy collision with Melbourne’s Ainslie Kemp in Round Six typified Hatchard’s intensity in one of the biggest hits of the inaugural season. Finished fourth at the Club for spoils and showed glimpses of a promising career ahead.